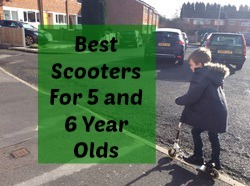 What are the Best Scooters for 5 and 6 Year Olds? At age 5 and 6 years old, my son was very capable of riding a 2 wheel scooter but there are some cool 3 wheel scooters for this age group too. This article details the best features to look for in scooters for 5 and 6 year olds based on my experience with my son. There are suggestions of ones we have tried out as well as suggestions of stunt scooters, electric scooters, dirt scooters and scissor scooters. JD bug are the leading brand of scooters in the UK and they are of excellent quality and top rated too. For 5 and 6 year olds there are 2 choices of JD bug scooters to consider. The first is the JD Jr Street Scooter MS100 which is designed for 4 to 8 year olds and the JD original street scooter. The features of each are discussed below. JD bug junior street scooter is a great first scooter for kids and is designed for young kids (around age 4) to around 8. It's a fab scooter for the school run and travelling from a to b. It has 120 mm wheel at the front and 100mm at the back and ABEC 5 bearings which give a fast, smooth ride. The bigger the wheel the faster you can go without lots of kicks so the 120mm wheel (which is larger than standard) means it's a great for scooter for cruising for younger school age children. It is foldable so you can carry it for youngsters when they have had enough and want to walk. It's fairly light to carry at 2.3kg, not the lightest scooter out there but not too bad! ​The handlebar is adjustable so will grow with your child. The maximum handle bar height is 84.5cm and the minimum is 63 cm. The wheels are made of PU with a hardness of 88A so are very durable. ​This would probably be a great choice for a 5 year old - perhaps for a 5th birthday gift. It comes in many colours for boys and girls. It also scores highly on value for money, giving excellent features at such a low price point. For six year olds it's worth considering the JD Bug original street scooters too. They have a maximum weight of 100kg so adults on the lighter side can use these too and it means the scooter will last for years. It's another scooter that's great for the school run. It's great for cruising with100mm/86A Clear Wheels wheels with ABEC 5 Bearings. It's foldable and lightweight too so you can easily carry it when you need to and it's easy to store. There's also a carry handle which obviously makes it easy for carrying too. It's heavier than the JD Bug MS100 (featured above) at 2.7 kg, so heavier to carry. Having said this it's quite lightweight compared to other two wheel scooters for similar age ranges. The handlebar is height adjustable so this scooter will grow with your child. The minimum handlebar height is 630mm and the maximum is 950mm. It is more expensive than the MS100 featured above but as the handlebar can adjust to 950mm so it's likely to last your child a lot longer. The footplate is 510mm x 100mm so slightly larger than the Junior scooter above making it a better ride for slightly older school age children. Not sure whether go for the JD Bug Original Street scooter of the JD Bug Junior Street scooter. Then check out a comparaison of the junior vs the original JD Bug. 3 wheel scooters are great for kids who have never had a scooter before, as well as kids who are less confident about using a scooter. Or perhaps they just like three wheels. They extra wheel tends to mean they are a slightly safer than their two wheel counterparts. The Maxi Micro is officially designed for ages 6 to 10 but it would be fine for a 5 year old too. If you're unsure you could also consider the mini micro scooter which is by the same company but made for 3 to 5 year olds. Check out a comparison between the mini and the maxi micro here. The maxi micro is a well designed scooter made with high quality materials so offers a smooth, quite and quick ride and is durable too. Read an indepth analysis of the maxi micro on our 3 wheel scooters for older children page. Another 3 wheel scooter designed for older children is the iscoot. It has some good features (PU wheels, adjustable handlebar and the scooter folds). It is a lot cheaper than the maxi micro but there may be a few compromises on the features. Read more about the iscoot featured on the 3 wheel scooters for older children page. Some 5 year olds are very keen to try and start doing some small tricks and jumps on their scooter. If this is the case, it's important to get them a stunt scooter. 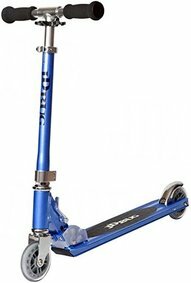 Stunt scooters are designed to be sturdy and withstand any abuse from tricks and jumps. They do tend to be more expensive as the materials used are stronger but still need to be lightweight for easier control. If you are considering buying a stunt scooter it's worth reading our stunt scooter buying guide and we also have a page with some suggestions of stunt scooters for younger children. Also find a good suggestion for a beginner stunt scooter below. Many stunt scooters are designed for kids aged 8 years and up, although this is changing and there are some stunt scooters designed for the younger child from age 5. If you do want a scooter that a younger child can do some tricks and jumps on, look for a high durability scooter with a one piece handlebar. It shouldn't be able to fold or be height adjustable to withstand the hard wear needed for jumps and tricks. Read my guide on stunt scooters to see what you should be looking for. Also check out my article on stunt scooters for 5, 6 and 7 year olds. This stunt scooter has been designed for a younger rider with a lower bar. It is aimed at kids from aged 6 plus. The lower bar at 19.5" (49.5cm) means it's designed to be a good height for young kids to be able to control when doing stunts. 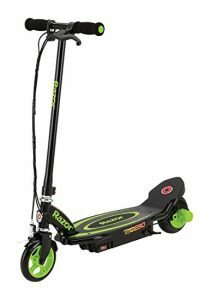 The scooter has been designed to be strong with a reinforced deck with strengthened neck, oversized triple clamp, and tapered headset, so will take all the abuse that younger kids. 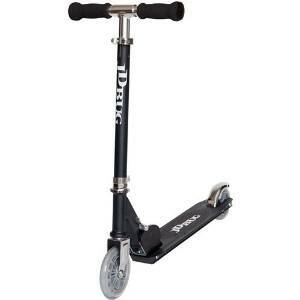 However, it's also lightweight enough for smaller kids to manoeuvre although stunt scooters are generally always heavier than kick scooters. Scissor scooters are a fun type of scooter that you see a lot of kids on. They have two footplates and you place a foot on each one. You can either move the scooter by moving your legs in and out. Or you can move your hips to get the scooter to move. They are best on flat, smooth surfaces but not for use for tricks or in skate parks. Lots of fun and a great way to keep youngsters fit and active. Scissor scooters are the new rage at the moment and lots of kids are using them. I haven't been on one myself although my niece and nephew have both got one which they seem to enjoy. Apparently they are very good for building the muscles in your legs. I'm not sure they will replace the traditional scooters in getting from a to b, but are good to have as an extra fun scooter to take to the park or to play with friends outside. There are quite a few models to choose from but if you're looking for a younger child from 5 to 6, make sure you get one that isn't too big. There are generally scissor scooters aimed at kids from around 3 to 6 or at age 5 plus and then other scissor scooters aged for older kids from 7 plus or 9 plus. Another thing to consider is an electric scooter which are super fun. To get an electric scooter its probably advisable that the child is already very confident on a push scooter. A 5 year old may be a bit too young, but a confident 6 year old will most likely love it. The scooter featured can reach up to 10mph. It will give up to 70 minutes continuous use on one charge. It requires a kick start to begin the motor. It also features a high-torque hub motor, push-button throttle, hand-operated front fender brake, urethane front wheel, and retractable kickstand. The motor is maintenance free. Dirt scooters are designed to go off road on rougher terrain. Most dirt scooters are designed for older kids. However, the bikestar scooter featured opposite is a great option for younger children. It's designed for kids from aged 5 years. The scooter features air filled 25.4cm (10 Inch) tyres on quality rims. The footplate is smaller than a standard scooter so perfect for smaller legs. It's a good option for scooting on surfaces such as gravel and grass, so can be used in the garden as well as on the pavement. There are some great 2 wheel scooter for 5 and 6 year olds who've never ridden a scooter as well as kids who are on their second or third scooter. Many 2 wheel scooters for this age have additional fun features such as scooter with lights and ones which also feature characters from their favourite TV shows or movies. The Micro Sprite scooters are 2 wheel scooters from the same company that makes the maxi and micro mini scooters. These have high quality PU wheels with ABEC 5 bearings and a durometer of 82A. This all contributes to a scooter with a smooth, quiet and quick ride. The handlebar is adjustable from 660mm to 960mm. . The scooter folds for easier carrying and storage too. It weights 2.7kg. The steering on this scooter is excellent. It steers like a bike with 360 degree turning. The Micro Sprite is aimed at kids from aged 5 to 12 years and will grow with your child too. It is is more expensive then other scooters but it's an investment. It can last for years and be passed on to younger siblings too. There are some great specifications on this scooter such as the 100mm 88A nylon core high rebound PU wheels are both great for doing tricks and cruising along the streets. The scooter featured is aimed at the 5 to 10 age group. It is height adjustable and is aimed at kids between 1.1 meters and 1.6m. The maximum weight is 50 to 80kg. Just remember it's best used on a smooth, flat surface. Is the micro sprite worth the money? See a comparison between the JD Bug Original Scooter and the Micro Sprite to help you make up your mind. The Bopster is currently one of the bestselling scooters on amazon. Lightweight - weighs just 2.8kg. Easy to transport and for young kids to control. 120mm PU wheels - the larger than standard wheels offer a smooth ride and less kicking is required for little feet to go faster and further. Adjustable - There are 4 settings on the height adjustble handlebar as follows 62-74-79-84cm. If you're after a fun, cheap scooter then there are lots of character scooters available. Generally these are a lot cheaper than other scooter. They are fun to ride but normally the quality isn't quite as good and they may not last too long. However, they can be really appreciated by kids. The scooter featured is a Frozen inline scooter and is typical of a character scooter. Razor is another well know and popular brand of scooter. The Razor S scooter comes in a fabulous green colour but there are lots of other colours to choose from as well. It is foldable and weighs 2.4kg so is not too heavy to carry. It features 98mm urethane wheels which feature ABEC 5 bearings. The wheels offer a smooth ride. There is a rear brake for safety. It's designed for kids from aged 6 plus. Foldable / Lightweight Scooter - at ages 5 and 6, there were times when my son had enough of using his scooter and he'd ask me to carry it. This is why a scooter that folds was still very useful. A folded or lightweight scooter is easier to carry. However, if they want a scooter to do tricks on they will need one without a folding mechanism. A scooter with a folding mechanism is not strong enough to withstand the impact from jumps, stunts and tricks. A scooter that offers a smooth and fast ride - at ages 5 and 6, children want to be able to cruise fairly quickly. Some 3 wheel scooters can be built so safely that they are slow and difficult to maneouvre. Lightweight 3 wheel scooters are normally faster than the sturdier and heavier counterparts. If you see an ABEC rating for the bearings, a higher rating generally means a faster and smoother ride. The best scooters usually have an ABEC rating of about 5. Wheels made of high quality polyurethane (also seen as PU) generally offer a smoother and quicker ride too. A safe scooter - safety is should be a top factor for anybody buying a scooter for a child. However, if safety is a major concern there are extra features to look out for. Look for a footplate which is close to the ground making it easier to get on and off and there's less room to fall. Make sure that the scooter is the right size. The handlebars should come up to about waist height, this means that it is easier to control. A smaller footplate is another features which means that it's easy for a child to control the ride. Look for a foot brake that is easy to use and make sure they know how to use it. Also don't forget helmets, knee and elbow pads and little ones can wear bright clothes and reflective jackets so they can be easily seen by cars and other pedestrians. Price and Longevity - you can buy scooters that will last your child for quite a few years. These are normally more expensive but will last a few years and you should be able to sell them if you decide to buy a different scooter. You may decide that getting a cheaper scooter that will last one or two years is a better decision. If your child is likely to grow lots, move from a 3 wheel scooter to a 2 wheel scooter or perhaps grow a lot in the next few years, it may be worth getting a less expensive scooter and buying a new one in a couple of years time.